Southwark Playhouse Young Company (YoCo) is a dynamic theatre company for young people. Each term two groups (for 14 – 18 and 19 – 25-year-olds) develop performance skills at free weekly workshops. They then apply these skills in professionally-supported productions at Southwark Playhouse. YoCo prioritises local residents and runs recruitment workshops at Southwark’s most challenged schools to engage young people who might not otherwise experience live theatre. Continue to provide YoCo members with access to the widest range of professional theatre-makers. Produce a fully realised production in the main house at Southwark Playhouse. Undertake specific projects including an inter-generational performance, collaborating with Southwark Playhouse’s Over 65s Company, as well as a festival of new work produced and curated by members of the Young Company themselves. Produce a programme of work to train some YoCo members as workshop facilitators, to enable them to support the youth and community work at Southwark Playhouse and develop the skills to pursue this professionally with other theatre companies. The award from the Bermondsey Square Community Fund was used to benefit both age groups. 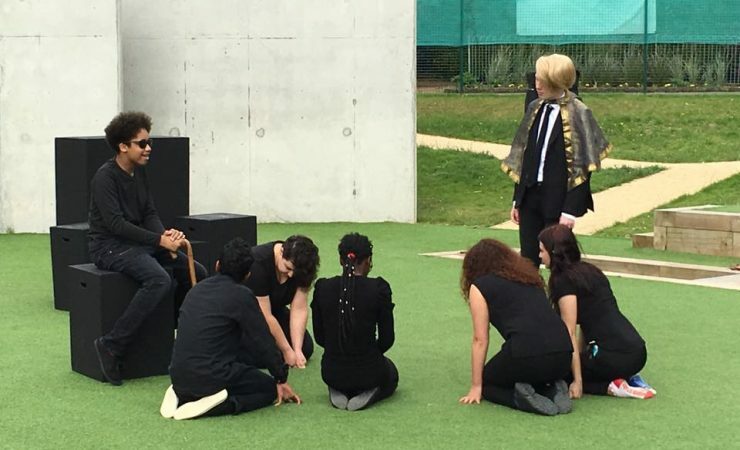 The 14 – 19-year-olds were able to perform a show they had devised at the Brighton Open Air Theatre as part of the Starboard Festival. The show was a great success and the group responded to the challenges posed with aplomb. “We definitely built a stronger sense of ‘company’ amongst the group members.” said David Workman, Youth and Community Director at Southwark Playhouse. The 19 – 25-year-olds focused on Shakespeare. They performed an edited version of Shakespeare’s Timon of Athens in the lovely surroundings of St George the Martyr Church in Borough. The company also teamed up with a local community theatre group who performed their own extracts from Shakespeare and gained a new audience for their work. During the summer holidays, YoCo also ran a week-long intergenerational project with members of the Southwark Playhouse Elders Company (for people aged 65 and over). The actors explored age and what it means. They showcased their discoveries in a short performance at the end of the week.